Welcome Artists & Art Lovers! What Is Sierra Art Trails? How do I get the Sierra Art Trails Catalog? What kind of artwork can be submitted? How will I know if my work is accepted? Order Your SAT Catalog Now! SAT Products • SHOP for the Arts! Bringing artwork into the public realm pulls together people from all walks of life. Public art beautifies, educates, and enhances our surroundings. It is a statement, indicating that a community cares about its culture. In 2008 Sierra Art Trails established the “Sierra Art Trails Public Art Fund” dedicated to realizing these goals in our Foothill Communities. We are very pleased to report that our project was successfully funded, with over $7000 in donations from our friends, clients, and community members. Thank you all for your donations! The sculpture is complete and on display at Gallery Row. 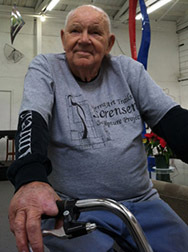 In 2012 Sierra Art Trails initiated “The Sorensen Sculpture Project”, the installation of a 16′ tall kinetic sculpture by Fresno’s Man of Steel, Chris Sorensen, at Gallery Row in Oakhurst. Chris Sorensen is one of Fresno’s most revered artists. His generosity and dedication to the arts is well known. His contributions and donations in Fresno and beyond number too many to count. When Mariposa Arts Council lost its headquarters in 2012 due to tragic fire, Chris organized a fundraiser. The annual Pink Show raises money for breast cancer research. His long standing support of Timberline Gallery in Oakhurst has helped to keep the gallery open. These are only a few of the many examples of his philanthropy. Sorensen Studio Gallery, located on 2223 South Van Ness Ave in Fresno, is a focal point for the arts, and houses the studios of many other artists. 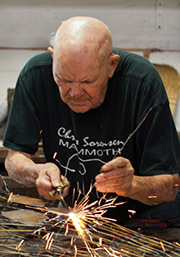 At 94 years old Chris is still going strong, producing both indoor and outdoor sculpture. We are honored that Chris has taken on this project, and proud to have the opportunity to install one of his works in the public realm. Chris at work on giraffe sculpture. The sculpture needed to be visible and eye catching, particularly for viewers passing by quickly on their way to and from Yosemite National Park. We focused on a design created by Chris many years earlier, a kinetic sculpture with a bold form, balanced kinetic elements, strong lines and bright colors. A tall blue base column raises the piece to a level that is clearly visible. The center section, a red hook-shaped arm, turns into the wind like a weathervane, and a small yellow crescent at the top is free to turn in the wind. Jon Bock and Chris Sorensen. We chose Kickstarter for our fundraising campaign in order to reach potential backers quickly on the web. Kickstarter is an internet based fundraising platform for Creative Projects. Fundraising on Kickstarter is All-or-Nothing. If we meet or exceed our goal, the project is funded. If we do not meet our goal we receive nothing. Backers receive rewards based on their donations. The higher the amount, the better the reward. Although this project has been successfully completed, please visit the Kickstarter Project Page to learn more about the fundraising, planning, fabrication and installation of the Sorensen Sculpture project, including a video. Please consider making a donation to the Sierra Art Trails Public Art Fund. Your contribution helps insure that our cultural life remains vibrant. Any amount will do! Donations of at least $50.00 receive a free Sierra Art Trails Catalog. Contributors to the Public Art Fund receive the same benefits as other Sierra Art Trails sponsors. For more information about your donation call 559-658-8844 or email info@sierraarttrails.org. 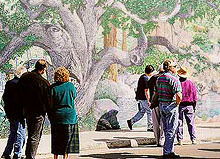 The “Seasons of Life Mural,” a 195 foot long mural painted on a concrete retaining wall along Road 426, is another example of public art in Oakhurst. The mural was spearheaded by local arts advocates Maggie Elliot and Jane Gyer with the aid of Yosemite High School students and other area artists. It is our hope that the Sierra Art Trails Public Art Fund will make similar projects possible in the future. Sierra Art Trails is a 501c4 non-profit corporation dedicated to supporting and promoting working artists and artisans, and benefiting the communities where they live and work by establishing a reputation for the area as an arts destination. 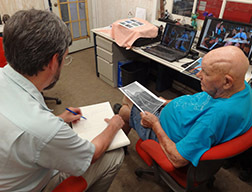 In addition to presenting an annual open studio tour in Eastern Madera and Mariposa Counties that draws thousands of visitors to the Sierra Foothills every year, Sierra Art Trails raises monies for student sponsorships, scholarships, and other art related projects, and holds special art exhibits, activities, and workshops throughout the year.